I have enjoyed playing Marvel Heroes so much that I decided to do a 'guide' on my Colossus Build. I'm not a pro player and I have always thought of myself as an average player skill-wise in almost all games I have played. In fact, I have never gone very deep into RPG games and the statistics of each and very power but somehow Marvel Heroes was different. I got so hooked into it and I have spent hours just checking out minute details that I usually have never bothered about. As long as I felt I'm killing mobs in a decent amount of time and I'm not dying too many times, I felt I was doing fine. 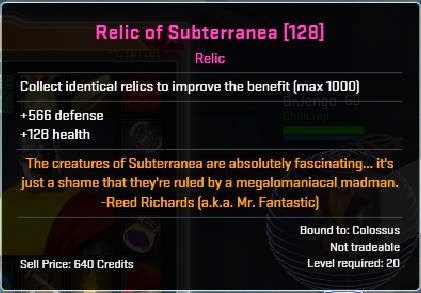 With Marvel Heroes however, I was always swapping items around to check the stat differences and with the help of the Training Room that's included in the game, I can even see the damage numbers for myself. This is my first time ever doing a 'guide' for any game so I'm very welcome to input. Do give me some constructive criticism.. After reading through the guide, you may even feel that I have no idea what I'm talking about but try to be nice. However, knowing the internet, if you got to say something nasty, go ahead. I am not very sure why I chose him.. a strong melee build isn't my favourite type of class. But I wanted to play a strong guy character after Deadpool. I believe I must have seen someone playing Colossus and I probably wanted to try him out. Or it could be that I just forced myself to play a character from the Original Ultimate Pack of heroes to make my purchase feel more 'worth it'. He was supposed to be a substitute Level 60 character for Deadpool till I finished prestiging him but I have enjoyed playing it so much. Colossus is at Level 60, with all story missions completed and with all mission rewards unlocked, including the 12 bonus Power Points. This is what his Powers Screen looks like. 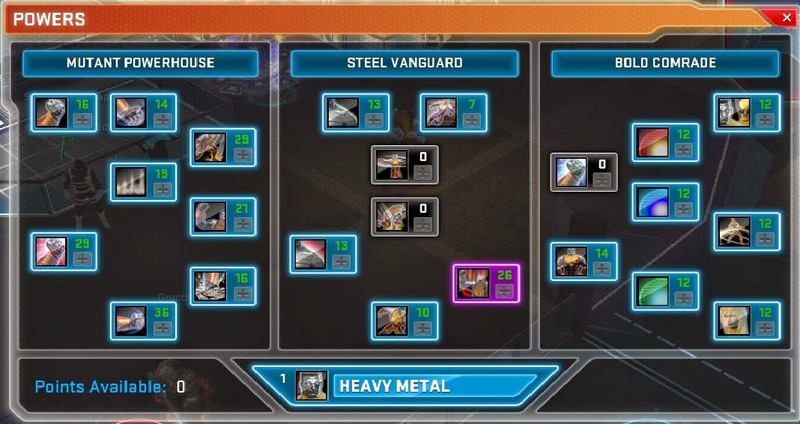 It almost looks like a 3-tree build but the Primary Build is on the Mutant Powerhouse and Steel Vanguard Trees. Getting a huge boost in the Bold Comrade power tree really helps me diversify my build, getting as much as possible from every tree. It also helped when the 2nd and 3rd set of Hotkey bindings were added so I could add more powers to my arsenal. Let's take a look at the powers I have chosen. Steel Punch - 29 (20): His primary/main punch. I call this his quick punch. I binded this to the Left mouse button and is his main attack power. Costs no spirit - I always believe every hero should have one of this as backup. It's no weak power either. Reeling Punch restores spirit and I was using this early on when I had spirit troubles but Spirit wasn't a huge problem at Level 60. 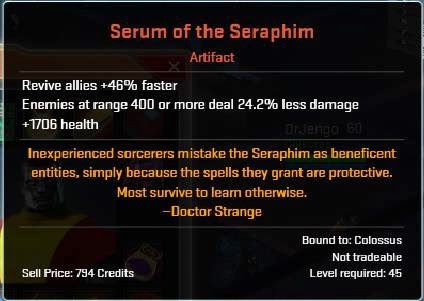 Besides SP was doing a lot more damage so I could wait for my Spirit to regen on it's own. Osmium Punch also wasn't good enough. Colossal Punch - 36 (20): His secondary attack or heavy punch as I call it. Binded to the right mouse button. Does a lot more damage than Steel Punch but slower and costs spirit. Have to use a bit more sparingly but I can do some good damage before spirit runs out. I like to use it on vulnerable enemies. Colossal Roar - 26 (20): Colossus' signature move, a must-have at max rank. Also very ideal for my build where I like to be in the midst of as many enemies as possible... Get everyone in close and then let out his roar! Unleash Colossal Punch on the downed enemies. Great against bosses too! Siberian Express - 10 (4): Not one of his main powers, but I like the feel of this. I also use this to move around. Osmium Charge seemed like he was jumping around. I had more control over his movement with Siberian Express. Also a good way to get close to the mob. Just have to be careful not to hold it down for too long as it drains spirit rather fast, in lower levels. 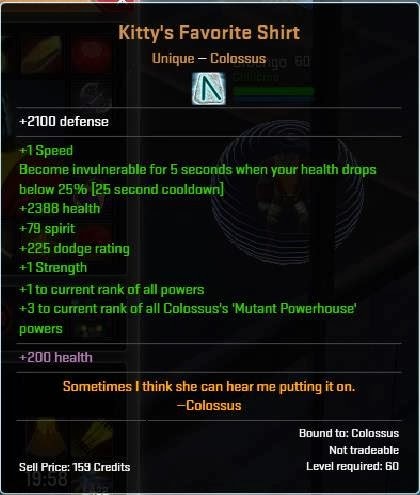 Besides, what a apt named power for Colossus! Demolition Stomp - 29 (20): I wanted my Colossus to be fighting up close and personal so the initial damage and the ability to make enemies take 10% more damage helps to take them out faster. Great for doing damage to enemies all around you. Fissure - 19 (10): Probably the least used of his powers. Mostly use it only in terminals when I can use this to knock enemies up in the air before using Siberian Express to get close to them. Also can be used on the rare occasion, when Colossus needs to get out of the fight. Still able to do a bit of damage from a safe distance. Heroic Challenge - 14 (3): Compliments the play-style as this taunts enemies to attack you. Get them in closer to you to do area-effecting powers. Weakens their damage as well, so they don't do too much damage to you. Inspiring Battlecry - 12 (1): Just 1 point in for a return of 12 ranks. An excellent investment. I could have put this 1 point into some of the powers mentioned above but it's amazing how much more I can get for that 1 point. 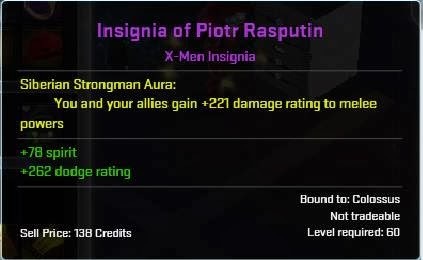 I use this aura most of the time, giving myself and allies more damage, especially in X-Defense. Vanguard Aura - 12 (1): Similar to one above, great returns for 1 point. I use it in cosmic terminals when the going gets tough. Sustaining Presence - 12 (1): Same as the other 2 auras. I tap this on between X-Defense waves to give a quick spirit regen to all. Break the Chains - 12 (1): Solid power for getting out of Magneto's control and a couple of other controlling effects. Just needed 1 point in this but I got more than what I bargained for. Fastball Special / Bond of Bloodline - 12 (1): When I started playing Colossus, I really liked this power. In fact, I love all summoning powers. You could see me in games like Diablo where I fight with a small army beside me. Skeletons, Skeleton Mages, Hounds, Gargantuans, you name it. The more the merrier! Fighting with more allies is just more fun! So I wanted to have these powers invested as well, having Wolverine and Illyana fighting alongside with Colossus will be fun. It was a little annoying that their duration was pretty short though. So I had to keep summoning them. However this strongly interfered with the build I wanted for Colossus. There just wasn't enough points to go around. If I put too many points into these summons, Colossus wouldn't be strong enough. Thankfully, with the high '+ to ranks' in the Bold Comrade tree, I could put a point each into this and get decent help when needed! Love summoning them just before using Colossal Roar and all 3 of us can bash the downed Boss! I couldn't pick a few or one of these over the other. Each Passive had it's own benefits, so I put in an equal number of points into each and let the ' + to ranks' do their work. His Durability and Strength are at max and his Fighting skill is pretty high too. Most of his powers are tagged as Fighting so the increased damage and speed helps a huge chunk. 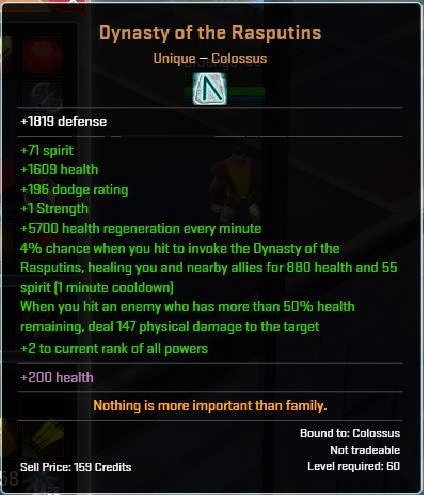 '-10% spirit cost' for Fighting powers also helps Colossus not drain out his spirit too fast. I also have been very lucky to get all his uniques just as I hit Level 60 and those played a huge part in certain aspects of his build. 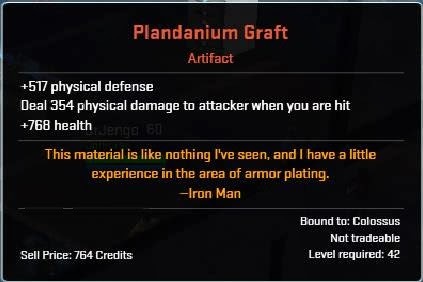 As I played Marvel Heroes, I found that the Uniques are very specially designed for the character and play to their strengths. Thus, my goal will always be to collect all Uniques for any character I play, which will compliment and affect the character's build. Mighty Fists of the Juggernaut - This item actually opened my eyes into deciding my 2 main punches. It was after seeing that '+7 to Colossal Punch' that I thought I should re-look into my punches and found that Steel Punch and Colossal Punch are much more superior. The frenzied attack speed is cool for the other-wise slow Colossus. 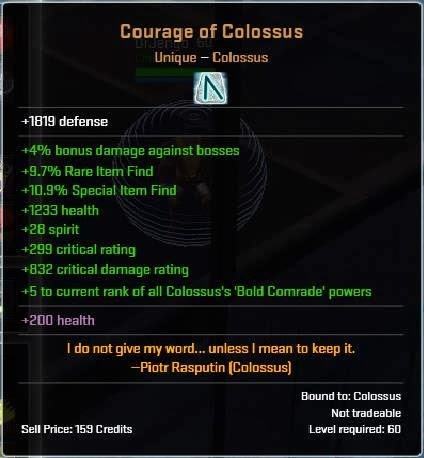 Courage of Colossus with its ' +5 to Bold Comrade powers' was a major factor in my decision to put in some points into that Power Tree. Only question was if I should go with Courage of Colossus or Bands of Cyttorak. The ' +3 to Steel Vanguard powers' was good but a lot of the stats made me favour Courage of Colossus in the end. Also decided to go with more HP and Area damage for the Enchants. 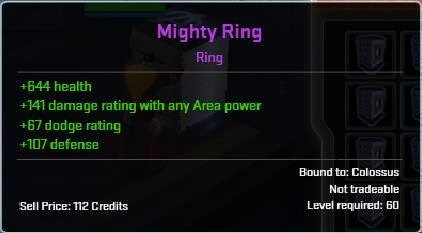 Ring for more HP, Defense and Area Damage. A cosmic ring still eludes me, so this will do for now. Again, more HP and Defense. Also adding 1 point to Durability to hit max points. Not sure why the first affix shows as 0% though, when it's supposed to be 40%. I was previously using the Bone Breaker runeword but decided to get this instead. Bone Breaker's '+1 to Strength' was a waste considering it was already at max without equipping it. Surprise! More HP and Defense! Do you see the trend here? If you noticed, the main punches I chose draw bonus damage from these 2 stats, so the more of these, Colossus also gains damage. 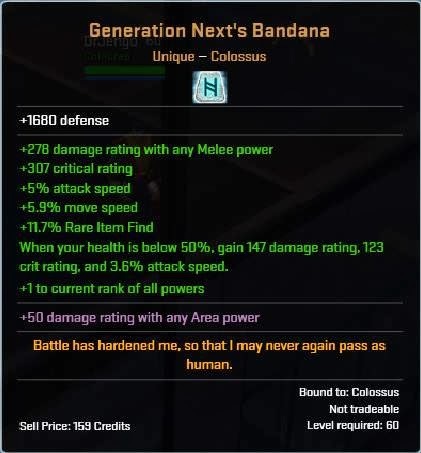 Colossus uses quite a bit of Area powers so I wanted an Artifact that boosts his Area powers. I like to drain his Spirit with Colossal Punch before switching to Steel Punch and this happens quite a lot, so it was a cool bonus to have. 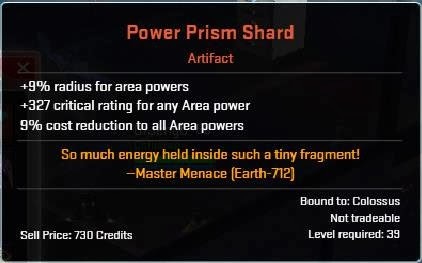 The ' +1 to all powers' is also very useful because of a lot of Passive Powers. I wanted this to boost his HP and with my play-style of getting up close and personal, it gives him bonus defense against those in range. Of course, reviving allies faster is always helpful! Of course, more HP & Defense.. but I'm using this for now until I get a White Suit Jacket. 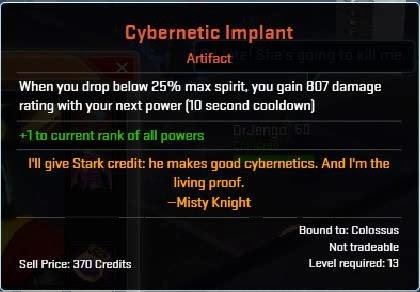 I know a lot of Colossus players use the Cyttorak artifacts but I want to hold them for Juggernaut when he becomes playable, so that both characters will feel different. 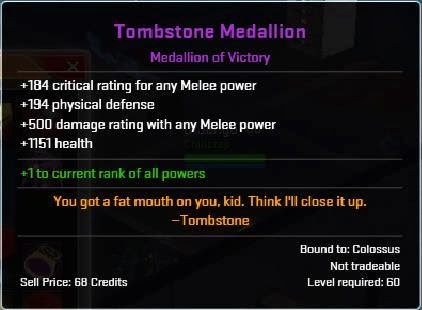 I felt that Tombstone best represents the way I play Colossus and the Medallion stats are also in line with what I need for Colossus. A match made in heaven. Still hoping for the Cosmic version to drop! Part of my obsession, you got to choose your character's own Insignia. The spirit increase is also very important for Colossus. 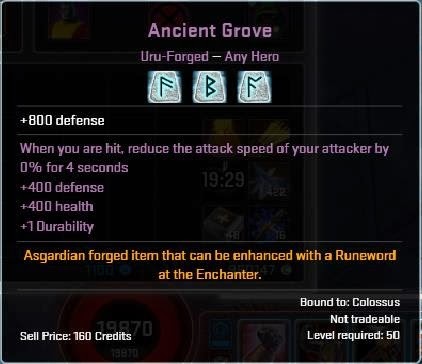 I chose all Defensive affixes for Colossus and I didn't go through the trouble to keep trying until I got the 'right' affix. Probably might consider doing it, when I have more spare credits. 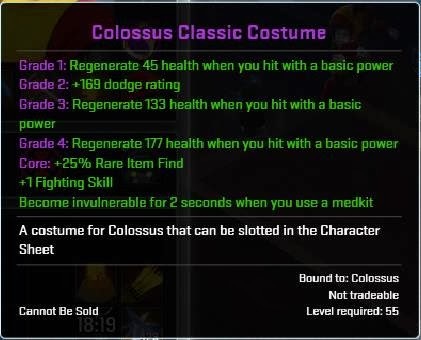 I'm looking for a Lvl 60 Costume Core with '+1 Fighting' and Regain 25% HP & Spirit when using a medkit, which will be my ideal.. but for now, this works fine. Quite a boring Legendary, but I thought that this was the most appropriate one for Colossus. It gives an all-round boost to all the stats that benefits him. 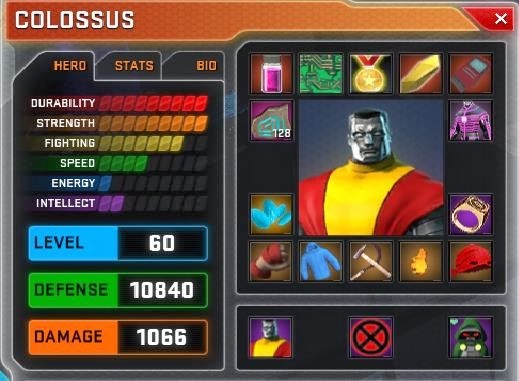 The Rank 5 bonus will be extremely beneficial for Colossus, considering the number of passive abilities he has. The relics will slowly but gradually increase his HP and Defense, and in turn his damage slightly. 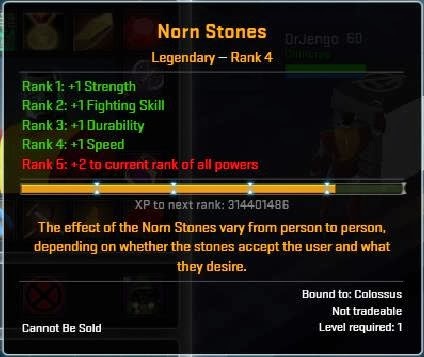 There is also a potential ' + 4 to all powers'; 2 from Norn Stones Rank 5, 1 from a Cosmic Ring and 1 more from a Cosmic Medallion. 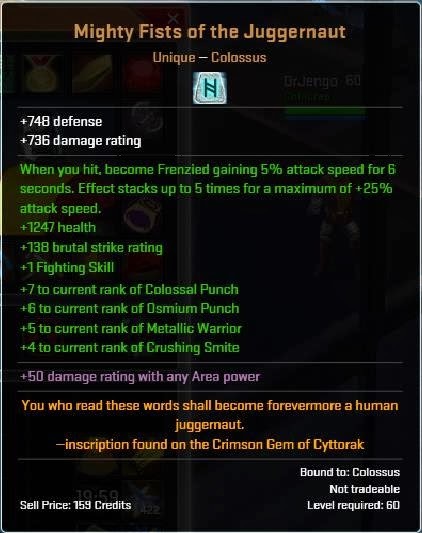 With the number of Passives and Auras, that's a lot of improvement that Colossus can gain. I haven't checked in detail but I believe some of the Uniques also have a chance of a better roll with the ' + to current ranks'. So that's quite a bit of potential improvement. I also haven't given Blessings to the Artifacts. I'm almost at 400 Odin Marks though.. If I can find some of the rarer Runes, I might change the Runeword to something better. Colossus does feel mighty, his Area powers do a lot of damage and his main punches can take out even Yellow Elites in a couple of hits. Even in X-Defense, he contributes a lot whether it's against bosses or mobs. He has plenty of powers to help out Allies and has enough powers to do a lot of damage on his own. An all-rounder character, without feeling weak in any department. He still has a bit of trouble solo-ing in the more challenging Cosmic Terminals so I'm hoping after the Blessings and a few more ' + to ranks', he will be able to ease through most Cosmic Terminals alone. I'm proud to say that this build was based on a lot of trial and error on my own, rather than looking at someone else's build. I have looked into forums on what people's opinions are on certain powers/items but I have tried and tested everything before tweaking everything to my liking. In a game like this, I wouldn't say he is 100% complete as it keeps evolving with new items, power changes etc. After getting the rest of his goals, I might do another guide, with the updates. I hope my Colossus Build was useful and maybe this could help you in your own Colossus build. I would really like to see some comments on my first ever guide. Just post in the Comments Section below as I want to see what others think of this. 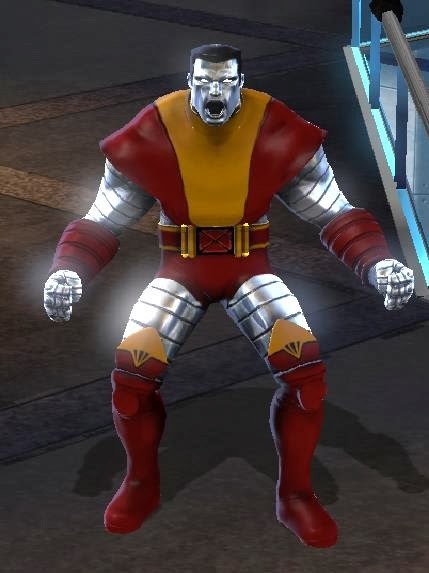 Like I mentioned before, it may not be the best build out there, but most importantly, I have enjoyed playing Colossus in this style.